If you’ve ever tried to take pictures of yourself you’ll know that it can be a pain. It’s especially hard to get that perfect shot of your godly features when you’re out of breath from sprinting across the room. OK, yes, they have remote controls for that. But what if you lost your remote or you just don’t want to have to carry it? [LucidScience] put together a sweet, um, “hands free” alternative. 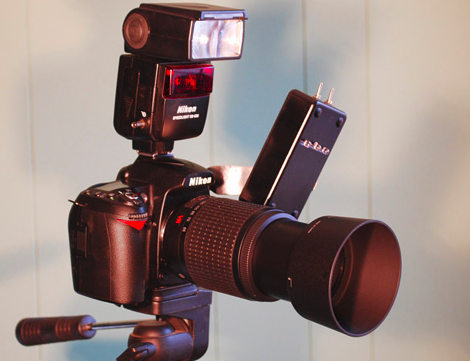 Essentially this hack emulates the IR signals sent by a Nikon remote, either to take a picture right away or to take time lapse photographs at regular intervals. We’ve seen a similar time lapse remote using an arduino before and a really thorough one using an AVR, but they don’t take the same approach as [LucidScience]’s design in terms of monitoring a microphone input for triggering. The project includes several status LEDs and adjustments for ambient noise and triggering, and it can be mounted to the camera body. We wonder how many of the Nikon’s features could be controlled using clap encoding, and how detailed your timing would need to be to have a kind of hand-made (get it?) pulsetrain syntax. You’d probably need to have world record clap skills. Check out the demo vid after the break. please stop with the “witty” headlines and just use something descriptive. seriously, they are all really really bad but this one hits a new low. plus it makes your google ranking lower because google prefers descriptive titles. The damn thing is almost as big as the flashgun. I don’t get what people have against PCBs and SMD. If he powered that thing with a couple of CR2032s and used a Tiny2313, that thing could be 10% the original size. Working on another version of this one to support other cameras and will have an interactive color LCD menu system. @BiOzZ: Maybe, but MoJo is still right. I don’t mind the lame jokes, but I subscribe to more feeds than I have time to read, and I like descriptive titles too. Anyway this is pretty cool. The Nikon ML-L3 remote is tiny and comes with a pouch that goes on your camera strap, so remembering and carrying it are non-issues, but the range isn’t so good and you need line of sight to the IR sensor on the camera. Well it looks like someone was listening because today there are no stupid titles. Like required says some of us read a lot of feeds. I prefer Electronics Lab for their no-nonsense approch and atmosphere. Samuel: don’t you ever have anything nice to say? I think dome people come here just to berate others.